Review of the XO Laptop, otherwise known as the OLPC from One Laptop Per Child at laptop.org. Garageband lets you create custom ringtones for free, Google maps improved, MacTracker for the iPhone and iPod Touch at iphone.mactracker.ca. In Chit Chat Across the Pond with Bart Busschots of bartbusschots.ie we talk about Anxiety App from anxietyapp.com, and ImageWell from xtralean.com. We also talk about how we both improved our blogs to be iPhone and iPod Touch friendly with the theme and plugin for WordPress from iwphone.contentrobot.com. Today is Sunday, December 16th, 2007 and this is show #127. I’m really feeling grateful at this time of year for all the good friends I’ve made through the podcast. Without this show, I never would have gotten to know Bart and Leo and Ben and Susan and Victor and Tim and Len and Robert and Martin and Connor and Donald and even crazy James. I’m sure I’ve forgotten to name some friends of the show here, but there are so many people who send me great ideas, prop me up by saying nice things about the show and writing nice reviews, I now have friends all over the world. I want to thank you for all you’ve done for me during this year. Even James who at least kept me in line. In 2005 I had the great pleasure of hearing Nicholas Negroponte from MIT speak at the All Things Digital conference about his dream of providing computers to the third world children in hopes of helping them pull up out of poverty. He described how he and his team traveled to many countries and studied how they used laptops they were given. the most compelling description he gave was when he explained that the children would bring laptops home so they could be used as a light source. This really set the understanding of how these people are living. Light. They don’t have light. I’ve gotten into debates with people about whether he’s way off base, because these people need food, water and medicine first. I don’t disagree that they need these things, and there are people trying to fix those problems directly. I think that a multi-prong approach is a good idea – food, water, medicine, and technology in the hopes of allowing them to learn from the vast knowledge available on the internet. Remember last week when I described the article from the Wall Street Journal about the kid in Africa who read about windmills in a used text book – imagine if he’d had the internet to read? Over the last couple of years Negroponte has followed his dream to create a $100 laptop (when it gets to high volume) and I’ve been frustrated by all the people who are whining about what this laptop is NOT. Everywhere I turn I read people saying “well, it hasn’t got a hard drive” or “the screen is too small” or “it’s only got 256MB of RAM” or “it’s only a 433Mhz processor”. People want these for THEIR children, completely missing the point of what this laptop is all about, the problem it’s trying to solve. In November, the One Laptop Per Child program (or OLPC) opened up to the public to purchase one of these so called XO laptops. You’ve heard of deals where you can buy one get one free? this is the opposite, it’s buy two get one! The idea is you pay for two machines and one gets sent to a child in a third world company (and you get the tax deduction) and the other one is delivered to you. I decided to take them up on this so I could see it for myself and do a review that looked at it from the perspective Negroponte had envisioned, not the spoiled developed world perspective. unfortunately I’m personally spoiled so my perspective is certainly skewed, but I’m going to try. Steve and I created a video showing off the XO laptop and my first impressions. I put the video in the shownotes so if you’d like to go watch that after you’re done listening to the ‘cast, I think it will really show you what this thing is like! Let me talk naming convention for a minute though – this laptop is technically called the XO Laptop, but I’m betting everyone calls it the OLPC. Forgive me if I dither back and forth between those names! I received my XO laptop on Monday and I’ve had a few days to play with it so I can give you some early impressions. * keyboard is amazingly small – fingers have to touch each other to hit the keys, keys very easy to push to type, but the space bar is not (have to push much harder). Literally easier to type on an iPhone, and I don’t find the iPhone easy to type on! Everything is rubbery – the keys are one sealed units – hey, I could pour a glass of wine in this laptop and not break it! * it has these two goofy green antennas (well, the whole thing is green) that actually latch the lid closed when you click them into place. * it has 3 USB ports, a microphone in, speaker out – and get this – a camera built into the right side of the screen bezel! * they did say it would have a pull string/foot pedal or crank – 2 out of 3, when I bought it – but it has none of these. From the 3rd world perspective I’m disappointed…remember that part about not having light? I wish I knew why they got rid of that option. they still say on their website that you CAN use these alternative power sources, so maybe it’s an option you can buy? * buttons across the top of the kb for home, neighborhood, etc. * thought it was crashing, but I noticed this curious red battery icon – tried pushing it, rebooting, nothing worked…and then I thought “hey, did I actually plug in the other end of the charger?” what a dork. the XO laptop has a TON of apps I haven’t even tried yet, but here’s a couple I have played with. * Write – word processor, but can’t figure out how to retrieve saved files. Will read PDFs so this could make an interesting ebook reader – at $188 it’s cheaper than the Sony Reader or the Amazon Kindle! * Games – haven’t gotten started with those yet, but the XO has built in game controllers just like on any standard Nintendo player – they’re built into the screen. the software is a bit unintuitive to me so far, but I’m hoping I’ll get used to it. For example, if you hover over an icon a pulldown menu will appear. If there’s a list in the pulldown, then you use your mouse to click on the item you want. In some cases that pulldown is there, but there’s nothing actually in the pulldown, so you have to go back to the icon and click it instead. The stop button in most applications is a big X, but if you hover over it, a pulldown shows saying STOP but you can’t click on it, you have to go back up to the X.
I’ll keep you up to date on things I discover over time, I’m sure I’ll be learning more about what this machine can do, but already I’m very impressed by the hardware capabilities of a $188 laptop. I really hope this effort works out to start helping to educate the third world and let them participate in this wonderful online world we now take for granted. I’m not sure why Apple decided to do this, but the latest update to GarageBand 4.1.1 actually allows you to create ring tones for your iPhone! Of course you can only use non-DRM music, in other words music you bought legally through the iTunes store is off limits. You can always rip your iTunes purchased music out to an mp3 CD and then read it back in, which i normally wouldn’t recommend because you lose sound quality, but for a cell phone sound effect it won’t matter a bit. Here’s all you have to do. Open GarageBand, and create a Real Instrument track. click on the Audio tab in the Media browser on the right. If you don’t see the media browser, down at the very bottom of the screen there’s two buttons, an “i” and symbol with some notes and pictures – that second one opens up the media browswer pane. Select a song from your library from the list below. the nice thing is that only the music you’re allowed to use as a ring tone will show up. Drag the song into the time line on the upper left. Next go to the share menu and choose Send Ringtone to iTunes. A window will pop up telling you that you have to adjust the length to under 40 seconds. When you click Adjust on that window it will give you a yellow slider on your timeline that you can move around to get just the part you want for your ringtone. You can shorten and lengthen the yellow slider just by grabbing the ends and dragging. Now go up to Share and choose Send Ringtone to iTunes again. this time it will take you over to iTunes and now on the left sidebar below radio you’ll have a Library category called Ringtones. Next time you sync up your iPhone, you’ll now have your new ringtones there to choose from! My friend Tim tipped me off that a few new features have come along on Google Maps, thought you might be interested. 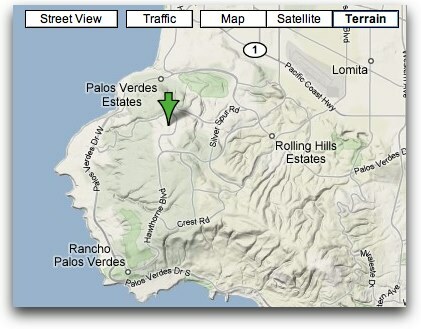 They’ve added a new way of looking at a map – you can see it in Terrain view now, showing in varied colors how lumpy the hills and mountains are. Kinda cool. There’s also a new button you can click when you’re in satellite view that toggles on and off labels – like street names and the street lines. I think they used to call this “both” for street and satellite view at the same time. It looks like they’ve expanded the street view too – that’s the creepy thing they’re doing where you can view photoimagery at street level and drag around on the roads with your mouse and move through neighborhoods. I still don’t know what use it is – I looked at some streets near where I live and for the life of me I still couldn’t figure out where I was on them! And it IS kinda creepy. As the year draws to a close and we all make our New Year’s resolutions, maybe one of yours should be to take better care of your car! I don’t just mean getting started on that clay and wax job you’ve been dreaming of doing, but also getting regular maintenance done on your Honda or Acura. I’m convinced that the main reason we get such amazing resale value on our cars is because Honda Bob has cared for them over the years – changing belts and replacing fluids and replacing brakes and all those things that are like getting your teeth cleaned every six months! Unlike traditional car maintenance, you don’t have to drive to a stinky icky facility and sit on bad plastic chairs, you get to relax in your own home and have Honda Bob drive to you! Imagine what it’s like to have a mechanic you trust and who makes car maintenance convenient for you? If you live in the LA or OC areas, you can live this dream by calling Bob at (562)531-2321 or emailing him at hdabob@aol.com. HDA Bob’s Mobile Service is not affiliated with Honda, Acura or Honda Worldwide. Way way way back on show number 30 I did a review of a great app called MacTracker. It’s designed to let you look up any Mac model ever made. the interface is awesome and it keeps getting updated to be even better. for ever mac you can see how much memory it takes, see all the colors it came in, even listen to the startup chime, and more. Ryan wrote in with two really fun tips about MacTracker – the first is that there’s a web-based version tailored for iPhone. this isn’t just handy for the iPhone, it’s also cool for screen readers, and if you’re away from your mac and you want to look something up. The web-based version is at iphone.mactracker.ca. it’s VERY nice! I love these new iPhone-tailored sites, they’re so snappy and fun! 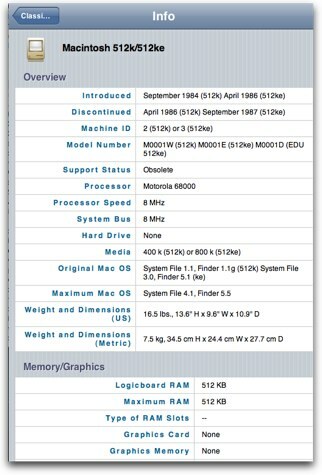 Ryan went on to point out a feature I didn’t know was there in the Mac-based version of MacTracker – you can designtate machines owned by you and even enter serial numbers and any AppleCare info that you have. This would be a fun way to go back down memory lane and gaze back on the Macs you’ve owned. Oh, c’mon, stop rolling your eyes at me, you KNOW you do it, just admit that you look fondly back on your formerly owned macs! Thanks Ryan for some great tips! Tim asked me if I would take a look at a piece of software called iStabilize from pixlock.com which is designed to eliminate the problem we all have from time to time – shaky video. This sounded like fun, so I gave it a shot. iStabilize opens the video in a very standard looking player with play, rewind, fast forward, and timer menus across the bottom. There’s also a couple of buttons that allow you to mark the in/out points for the area of the video you want to stabilize. I’ve now described everything in this software that was intuitive and easy to understand. I was lost from this point onward where I was forced to reduce myself to the dreaded act of reading the documentation! You know how I hate that, but for the love of shareware, I bit the bullet and started reading. If I thought I was lost before, it was nothing like what I ran into in reading the documentation! While there are a lot of pages of explanation, they use phrases like “temporal portion of the movie” and “holding motion data and controlling spatial properties”. um…what? Whoever wrote the section on setting the in/out points did a great job going into great detail of all the ways you can set the in/out points – with the letters i and o, with the buttons for that purpose, all sorts of ways. However, whoever wrote the more complex concepts just didn’t spend the necessary time. Here’s an example of the workflow in iStabilize. You open a movie, set the in/out points, and then hit “track motion”. then it yells at you to tell you that you can’t track motion because you have to save it to another file first. ok, fine, I save it out to another file, and again choose track motion. The screen got all messed up with text falling all over itself – the 2 radio buttons that were supposed to be at the bottom also ended up at the top of the screen, so it was impossible to read what was going on. I put a screen shot in the show notes to show you what I’m talking about. Ok, now I’ve told it to track motion, now what? I found a big colorful eyeball, so I clicked that, but it yelled at me that I haven’t created a Control Track. Um, what’s a Control Track? I searched the documentation for a concise explanation, in engineering and science it means to create a test group or area where the problem is not occurring, so I thought maybe I was supposed to set in/out points on a non-jiggly part of the video? Nope, guess again. Is there “create control track” in the menus? nope. I read in the documentation that I’m supposed to select “”edit current track” and THAT will create the control track. Um, why didn’t you just call the menu pick that? I guess I was supposed to figure it out from the fact that the keyboard shortcut is command-g? Ok, we’re finally getting somewhere, right? We have some fun looking sliders now. We can control jerkiness in horizontal, vertical, rotation and zoom with little check boxes (which i didn’t even have to read to figure out!) then there’s 4 sliders – the first one is called Stabilize, but the scale of stabilize is time. Huh? Back to the documentation where I read that you’re trying to tell the software how fast the jiggling is. If you have a slow roll going on, like maybe a happy drunk had the camera or you’re on a freight linter, you would set the time scale high to several second because that’s the rate the jiggling is happening. Likewise if your videographer was heavily caffeinated, you might have a high frequency jiggle so you’d speed it up. Again, not at all intuitive – the jiggling isn’t time, it’s jiggles PER second, or some sort of frequency measurement. Oh well, the documentation did explain that well. The safe region is given as the largest rectangle within the movie space, which has no overlap with any margin in any frame throughout the specified temporal range. Oh sure, now I COMPLETELY understand! Sheesh. I kept reading and never could draw a direct correlation between the menu and the explanation. It’s important at this point to explain what they’re going to do in order to make the movie stable. They’re going to take it and sort of float it inside a black margin (you can change the color). it’s sort of like the video stays still in the middle but there’s this black border/margin that’s sort of distracting and bouncing around. If you apply zoom to the movie at this point with the next menu, you can eliminate that margin so it’s not as obvious. I did like the way you could apply these different options and move the sliders around and see the changes right away. I need to also explain that the first hour that I worked with this software, for the life of me I could not get any of the options to affect the movie in any way. I could set the in/out points on the timeline and it would turn grey to tell me I had affected it, and I could edit the settings, sliding the sliders all over the place in order to try and force a dramatic change to the movie, but nothing would change. I did hit “finish edit session” which is what actually applies the effects to the movie (again, unintuitive wording) but it did not affect the movie in any way. I’m not sure why it started working later in the day, the only thing I can think of is that quitting and reopening the application kick started it, because I didn’t learn any new tricks while I was away from it. Unfortunately I did learn something about the developer of this software while I was away from it. I was clearly stuck in the morning, so Tim suggested I shoot off an email to the developer. I explained at length to the pixlocks folks where I was having trouble, explained that in spite of reading the documentation I could not understand some things, like what a control track is. I was positively shocked when I got back an email that didn’t answer any of my questions. Where I explained that in reading the documentation I didn’t figure out what a control track was, he asked me if I read the chapter on it. He even said “there, it is clearly said” and went on to quote the chapter I’d already read. When i explained that I pushed the sliders to their extremes in hopes of seeing some effect on my movie, he told me to use the default values, not in any way explaining why it was doing nothing to my movie. stabilization or took the effort to read the documentation. I wonder if such a review could be worth for anything? Seriously. I couldn’t believe what I was reading! I have gotten so used to the shareware love, that it never occurred to me that I would run across a developer so arrogant that he would spit in my face when I asked him questions. I was disgusted. I did end up going back and forth with him a bit (where I expressed my opinion of his letter to me) and he apologized and made an attempt to actually explain things to me, but I’m having trouble getting over his initial statement to me. 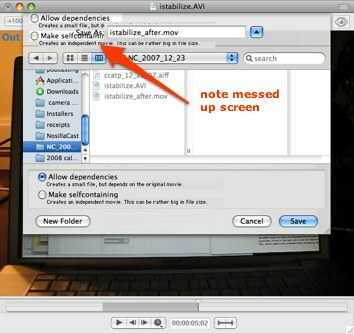 iStabilize does stabilize your movie, and it has some interesting effects to make it less obvious that you’ve done so, but the menus are unintuitive, the help files are written in a secret language they’ve developed, and the developer is somewhere between condescending and disrespectful. iStabilize is 22 euro or $32 US at today’s exchange rate. Thanks Tim and I hope you and your listeners have a great holiday filled with laughter, friends and family, and of course many Macintoshes. gives you a theme and a plugin – plop them both in place and automatically recognizes the Touch and iPhone browsers. check it out on podfeet.com AND bartbusshots.ie/blog – if you go to our sites with an iPhone or an iPod Touch, they’re a dramatically simplified version. I wrote to the developer to ask if this could be modified to identify screen readers and the wrote back with enthusiasm that they’d like to talk about it early next year to see if they could do it! I’ll have to enlist Susan Gerhart on that one – I’m not a developer, I’m just the idea woman! ‘strange’ interface, takes a while to get comfortable with – worth it though, would be lost without it for the blog, good for re-sizing and anotating images, very odd model for saving, free! After the show I went out and bought the Extras pack for Bart for Christmas! the extras pack is only $20 Canadian (which is $20 US right now, or 14 euro.) the extras pack will allow Bart to do batch image processing, so he can add his drop shadow and shrink the image to 400 pixels wide in one step on a lot of photos. It ill also give him more objects, shapes and line styles, allow him to merge images, use gradients, create templates, lots of fun for Bart! I’m sure he’ll come back with a review on whether this cements his love for ImageWell! I think that’s going to wrap it up for this episode of the NosillaCast. I wish all of you happy holy days – safe times with friends and families filled with laughter and fun. Eat too much, drink too much, play too much and I’ll talk to you one final time before the end of 2007. Keep up your great emails – hey, let me know what cool tech toys you get for the the holidays! Send those emails to allison@podfeet.com. Thanks for listening, and stay subscribed. The annoying problem with Leopard of the printer icon remaining in the Dock after printing can be resolved by control (right) clicking on the icon and switching on the Auto Quit feature. I’d like to wish you and all of your listeners/viewers a Merry Christmas and Happy New Year. I hope 2008 will be a very successful year for the XO project. Thanks Phil – great info. I wonder if you’d never seen a “normal” laptop if these oddities to me would not be weird at all to them. I find the interface pretty strange but I’m getting used to it. I had a 17 year old play with it today to see if he could find any games, but so far we’ve come up dry other than a version of the card game Concentration where you flip over cards and try to find pairs remembering along the way. I was hoping to find something to try out the game controller interface. On the Journal, I wonder if you have to just scroll and scroll back in time till you find the activity – maybe there’s a search, I’ll have to go check. Thanks for posting this awesome video review. I posted it up at http://olpc.tv if you don’t mind. Yup check out the Journal for all your saved documents and files. The point is that you should be able to find your docs by searching or narrowing down by date, by type and stuff like that, instead of forcing children to think about creating and managing Folders as on an old type of OS. I think you can find Emulators for Super Mario games and Doom for it if you search for the Informations online. You might have to do some typing of commands in the Terminal to install those though cause they might not be totally official yet (waiting possibly for Nintendo to volunteer and offer all their games to the OLPC project for free). Otherwise, there should be lots of cool legal games for it already, perhaps you can find some info how to install those at the OLPC wiki by searching for games. I guess that the video quality is by default set to a low bitrate to save storage space. So for sure with only a few kilobits per second the video isn’t going to be super smooth, and considering also that the included camera is the kind of camcorder quality that cell phone type cameras achieve or other laptops even expensive laptops that include built-in webcams, I guess the quality should be about the same. Perhaps if the video can be stored somehow to the Internet such as directly from the laptop to Youtube or some other type of School server and such, then perhaps the bitrate could be set higher for better quality. It should work with iChat and other video-conferencing such as Skype video-chat or MSN video-chat, the day that those commercial software providers decide to be compatible with the open-source video codec and the open-source IP communications protocol that the XO is using. I think this type of technology most certainly also should have a market here in the developped countries also, that is cause right here also there is a digital divide, and there are no other laptops in the $200 price range. That is why I think Intel and Asus has been eager to delay the OLPC project, cause those established expensive-laptop companies are afraid that people will start buying such cheap laptops over here in the developped world. Cause most computer users here in the developped world just need a browser and word processing. And this type of cheap hardware seems to be just fine for that. So it will suit 95% of consumers in the developped countries I think. Some company just needs to release a commercial version of this with an adult sized keyboard. Mind? I’m THRILLED you posted my video on olpc.tv! I’m excited there’s people really getting into this. The compression on the video is definitely because of disk size because the video as it’s being captured is fantastic. The photos look good too. I’m so glad you posted the video of the OLPC computer. I wanted to donate/buy one myself but funds were tight. I was curious what the programs looked like. Thanks for showing us the product and giving us your impressions of it. We had a discussion about this project at work and most of the vocal people thought that the money should be spent on food and health care for the poor children in 3rd world counties. I disagree. There’s lots of organizations that can provide food and health care. (Whether they do is another debate.) If these children are given a tool that can access world information, they might develop new ways to help their families and villages. The XO laptop could be the firework that once ignited could bring a shower of ideas on how to improve their current condition. I think it’s a fabulous idea for improving the lives of families in 3rd world countries. It might take a few generations before we see noticeable change, but I firmly believe it will happen. I do wonder how many children with the XO laptop will have wifi access and also how the extreme poor will find a way to power the battery. The inventors must either have faith that it will happen or a plan for distributing the laptops in areas where wifi and electricity are available. Nice video it shows the detailed information about the laptop reviews. Everyone should bookmark this website for the future purpose how to operate the laptop.